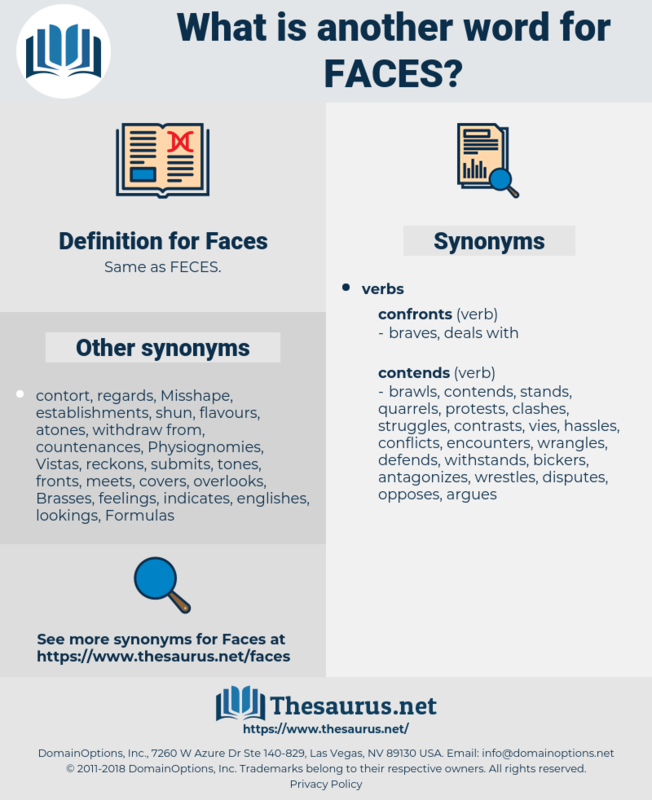 What is another word for Faces? 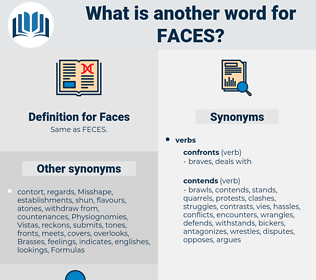 representing, appears, represents, rencontres, office, exposition, receives, fair, represent, exhibition, sessions, gallery, individuals, Persons, sees, exhibit, gatherings, confronting, stands, expo, VS, imame, gets, posts, confrontation, confronts. appearances, characteristics, manifestations, considerations, expectations, perspectives, head, heads, pieces, Personalities, aspects, professionals, respects, channels, terms, ways, headings, cattle, TCES, direction, directions, contours, components, images, concessions, responses, Areas, hands, dimensions, elements, features, undermines, expressions, charts, Angles, manholes, FORMATS, witnesses, entrants, objects, regards, Entities, spheres, shapes, sights, Animals, Noses, warheads, Quantities, Shiners, PAGES, patterns, reputations, shores, Gules, parts, Ones, Lives, thinkers, walls, Brains, graphs, strands, cows, drawings, phrases, members, figure, figures, layers, points, things, guises, minds, Forms, levers, TONNES, Capita, modes, partitions, teeth, Styles, portals, problems, traits, Pigs, swans, tows, tops, buds, kinds, birds, boys, Strokes, MINES, appears, LINEs, individuals. challenges, experience, experiences, announces, suffers, acknowledges, places, afflicts, transverses, Affects, contemplates, appreciates, Responding, responds, identify, identifies, exists, falls, recognises, constitutes, combats, rebuffs, threatens, intercepts, tackles, confers, assumes, understands, competes, expects, encompasses, manages, potential, directs, recognizes, advocates, lead, corresponds, envisages, creates, introduces, Carries, awaits, organization, organisation, feels, agrees, supports, presents, deals, traverses, resists, explains, answers, undergoes, sustains, becomes, Records, handles, targets, concerns, establishes, illustrates, collides, overlooks, arises, Towards, remains, considers, describes, poses, attracts, stipulates, delivers, compares, comprises, Bears, entails, Comes, mentions, examines, outlines, casts, consists, contains, treats, solves, incurs, waiting, Waits, observes, operates, fights, registers, causes, exhibits, possesses, costs, refers, notes, sets, satisfies, views, resolves, covers, maintains, resides, includes, risk, Risks, occurs, enjoys, moves, imposes, aligns, team, teams, head, heads, approaches, submits, hindering, discusses, touches, belongs, provides, offer, offers, is, serves, relates, Met, Travels, yields, exposes, retains, OWES, ingest, attaches, hears, draws, lies, aspects, protests, involves, underpins, displays, loom, looms, hinges, seeks, lifts, respects, aims, crashes, crosses, finds, brings, paragraphs, Plays, Rests, owns, needs, stores, lays, hosts, intends, hits, hurts, ante, know, knows, happens, Has, throws, pits, Gives, raises, says, matches, applies, begs, features, Strikes, fits, marks, SITS, passes, drops, means, asks, takes, logs, goes, puts, objects, shows, regards, com, study, Gules, wins, makes, Lives, tries, holds, points, cuts, runs, sheds, flows, 's, Does, appears, represents, receives, sees, exhibit, stands, gets, confrontation, confronts. As I looked into their faces I saw no hope for Europe there. fabaceae, ficus, fuze, feijoa, f.i.s.c., fogey, fuzee, fax, fes, fish, fichu, fuggy, fuchs, fuji, FWS, fiji, fossa, fag, foggy, FCS, fisheye, favus, foppish, fagaceae, fogyish, fizzy, FCC, fish hawk, fives, faux, fusee, fuego, fuchsia, fescue, facia, fess, fucus, Fice, fucaceae, fica, fuss, fuscous, FISC, fizgig, fukuoka, fug, fesse, fagus, fugue, fogy, fascia, fugu, faeces, FAQ, fuzz, faze, fix, Fugo, fishy, fig wax, FPS, fig, fiasco, fasces, fog, focus, fauces, fake, fuzzy, fugacious, fox, fishhook, fosse, fizz, fish cake, fsh, FISA, feces, fawkes, fuse, fishgig, fez, fijis, foxy, fussy.